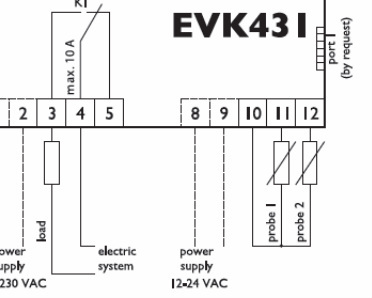 EVK431 is a digital controller for warm showcases management. 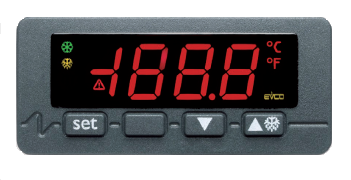 The device finds a use in those applications where it is required to join the regulation to a temperature and to show another one, in a working range between -50 °C and 150 °C (-50 °F and 300 °F). • 1 digital output (relay) for heater management (16 A @ 250 VAC). point and function icons) and 3 buttons (set, up and down). Installation is by panel, with the click brackets supplied by the builder. Through the programming key EVKEY (to order separately) it is possible to make the upload and the download of the configuration parameters. 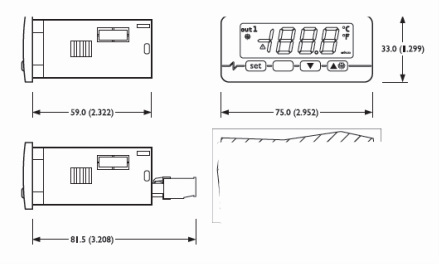 Through a serial interface (to order separately) it is also possible to connect the controller to the plants monitoring and supervision system RICS (via TTL, with MODBUS communication protocol). The use of the device with EVKEY and with RICS is allowed on condition that the controller has got the serial port (by request). load relay 16 A res. @ 250 VAC (change-over contact).